The Post Office, unlike other government agencies, receives no tax revenue. Like private enterprise they have to make money the old-fashioned way — they have to earn it. And that’s the problem — they aren’t earning it. There are several reasons why the Postal Service is going broke but the station manager’s attitude is one that could be and should be corrected immediately. People don’t like to do business with people who don’t know how to get along with people — or dogs. Charlie Mitchell may not be a certified service dog but he could teach the station manager a thing or two about customer service. 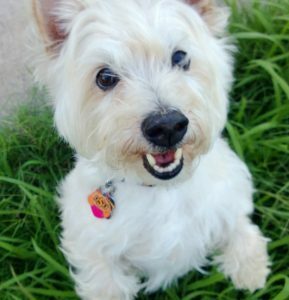 Charlie is a 17-pound West Highland Terrier. Well he’s mostly a Westie. Charlie is a rescue dog. Everywhere Charlie goes he makes friends. Charlie makes people feel better. When my mother lived at the Methodist Manor I used to take Charlie to visit. He’d trot down the hallways smiling and stop to greet residents and staff alike. People’s faces would light up when they saw Charlie. Everybody likes Charlie. Well, nearly everybody. The station manager didn’t seem to like him. But I think he doesn’t like dogs or people. The station manager could have turned his encounter with Charlie and me into a positive customer service experience. He could have given Charlie a pat on the head and told me he was an exceptionally handsome and intelligent dog (which he is). He could have introduced himself and thanked me for my business. He could have taken the opportunity to get acquainted and learn more about my business and how he could better serve me. He could have done all of that and then politely let me know his policy about dogs in the Post Office. I would have graciously thanked him and walked away impressed. But I don’t think he even thought of me as a customer. I was a compliance issue that needed to be rectified. And I left the Post Office feeling rectified. If you want to go broke in business you’ll be off to a good start doing what the station manager at my Post Office does. The station manager does not smile. He does not make friends. He does not make people feel better. On the other hand, if you want to succeed in business you’ll be off to a good start doing what Charlie Mitchell does. Smile. Try to make people feel better. Try to make friends. If a dog can do it, you can too.